Freedom of speech is the foundation of a healthy democracy. So is the art of balancing democratic values, such as liberty and equality with safety and security. For democracy to thrive, citizens must be able and willing to express and exchange ideas among themselves and with their representatives in government and be able to weigh courses of action and potential consequences. Free speech ensures that conflicting views can be voiced, heard, and understood. Without free and open discourse, meaningful deliberation on public issues grows more difficult, the bonds of political and civil society weaken, and democracy withers away. When values are in conflict, freedom of speech becomes a critical vehicle for exploring choices, weighing options, and finding Common Ground. Deliberating civic issues—weighing opposing views, deciding difficult questions, accepting majority decisions while honoring dissent—is not natural behavior. Deliberation requires instruction, skill, and multiple opportunities to practice. The Civic Mission of Schools report notes that “Of all institutions, schools are the most systematically and directly responsible for imparting citizen norms”(Carnegie Corporation of New York and CIRCLE, 2003). Schools can engage students in discussions of substantive content on the institutions, governmental systems, and basic principles of a democratic society. While civic participation in both emerging and stable democratic societies depends on the ability to engage in deliberative discussions of controversial issues, there is little evidence that in-depth discussions of controversial issues regularly occur in either in the U.S. or in countries in Eastern Europe (Gimpel et al., 2003; Larson & Parker, 1996; Niemi & Niemi, 2007, DEEP; 2000). Civics teachers often avoid controversial issues or address them as current events without much insight or reflection. Hibbing and Theise-Morse show that although many Americans recoil from a system they perceive as driven by narrow self-interest and messy conflict, “to the extent the climate in schools these days avoids controversial political issues and does not help students to be comfortable in dealing with those issues, a great disservice is done to the students and the democratic process” (Hibbing and Theise-Morse, 2002). 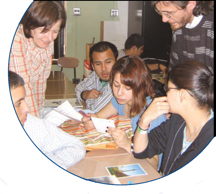 The International Association for the Evaluation of Educational Achievement (IEA) study of 90,000 students in 28 countries reported that an open classroom climate for discussion is a significant predictor of civic knowledge, support for democratic values, participation in political discussion, and political engagement (measured by whether young people say they will vote when they are legally able) (Torney-Purta, 2001). When civic deliberation is taught in school, it can enhance students’ academic knowledge (Harris, 1996) and build civic skills, especially the ability to discuss with others how to solve pressing public problems (Hess & Posselt, 2002). “When students have the opportunity to discuss controversial public policy issues in a supportive atmosphere, where several sides of an issues are presented or explored, and they feel comfortable expressing their view even when they differ from the teacher’s and other students’, then there is a great likelihood that adolescents will express higher levels of political efficacy, interest, trust, and confidence than their peers without such experiences” (Hahn, 1998). Researchers find that the deliberation of controversial public issues can play a central role in increasing political knowledge, political tolerance, perspective taking, and political participation (Gimpel, Celeste, & Schuknecht, 2003; Zukin, Keeter, Andolina, Jenkins, & Delli Carpini, 2006). Research indicates that students who effectively participate in deliberations on controversial public issues increase their political knowledge, political tolerance, perspective taking skills, and political participation (e.g., Hess, 2009; Parker, 2003; Torney-Purta et al., 2001). Benjamin R. Barber. Strong Democracy: Participatory Politics for a New Age, Twentieth-Anniversary Edition (2004). Carnegie Corporation of New York and CIRCLE: The Center for Information and Research on Civic Learning and Engagement. The Civic Mission of Schools (2003). Gimpel, J.G., Lay, J.C., & Schuknecht, J.E. (2003). Cultivating democracy: Civic environments and political socialization in America. Washington, DC: Brookings Institution Press. Hahn, C.L. (1991). Controversial issues in social studies. In Shaver, J. (Ed). Handbook of research on social studies teaching and learning (pp. 470-480). New York: Macmillan. Hess, D., and Posselt, J. (2002). How High School Students Experience and Learn from the Discussion of Controversial Public Issues. Journal of Curriculum and Supervision, 17(4), 83-314. Larson, B.E., & Parker, W.C. (1996) What is classroom discussion? A look at teachers’ conceptions. Journal of Curriculum and Supervision, 22, 110-126. Niemi, N.S. & Niemi, R.G. (2007). Partisanship, participation, and political trust as taught (or not) in high school history and government classes. Theory and Research in Social Education, 35, 32-61. Nystrand, M., Gamoran, A. & Carbonara, W. (2001) Discourse Environment and Student Achievement, Report for the Office of Education Research & Improvement, U.S. Dept. of Education. Torney-Purta, Judith and the International Association for the Evaluation of Education and Achievement (2001) Citizenship and Education in Twenty-Eight Countries: civic Knowledge and Engagement at Age Fourteen. Amsterdam: International Association for the Evaluation of Educational Achievement. Zukin, C., Keeter, S., Andolina, M., Jenkins, K., & Delli Carpini, M.X. (2006). A new engagement? Political participation, civic life, and the changing American citizen. New York: Oxford University Press.